In soup kettle combine first 9 ingredients; bring to a boil. 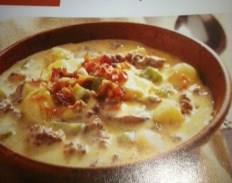 Reduce heat; cover & simmer for 15-20 min or until potatoes are tender. Meanwhile, in a large skillet cook beef and mushrooms in butter over medium heat until meat is no longer pink; drain. Add to soup. Stir in 4 cups milk. Heat through. In a small bowl, combine flour and remaining milk until smooth. Gradually stir into soup. Bring to a biol; cook and stir for 2 min or until thickened. Reduce heat; stir in cheese until melted. Garnish with bacon.